Published February 3, 2018 By Anna T. This post may contain affiliate links. Regardless, I only recommend sites I've researched and/or used and trust. You don't need any special skills or expertise to sell things you want to get rid of! This is an at-home money opportunity that pretty much anyone can do. There are all sorts of products that are particularly valuable as resale items, including everything from makeup to old textbooks and clothes. Some of the sites listed below are also perfect for crafters, artists, and recyclers who take old products and make them into new ones. Selling your old junk is a great way to declutter your life while avoiding waste. Why throw things in the trash when there are thousands of people who'd love to buy them at a discounted price and reuse them? 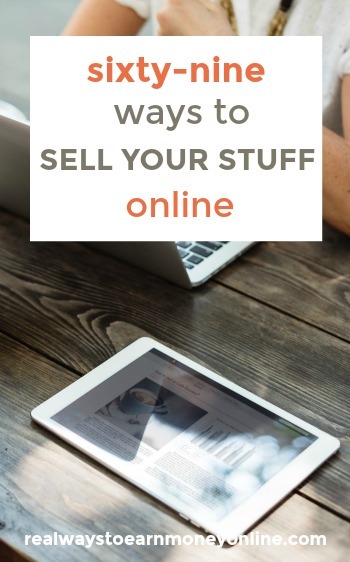 You can make quite a bit of money with a lot of these sites, and in most cases all you have to do is take a picture of the item you're wanting to sell, or request a shipping kit so you can send the items in for inspection. Even in cases where the profit opportunities are more limited, the time investment is so small that it might well be worth it anyway. Decluttr – Use Decluttr to get rid of your used CD's, DVD's, Blu-Ray's, and games. You can either enter there barcode for your item on their website to see an instant offer, or you can download the Decluttr app to scan the barcodes for your offer. Second Spin – You can sell your used CD's, DVD's, Blu-Ray's, and games to Second Spin. You do have to pay for shipping, but they will reimburse you depending on the number of items you send that they can accept. SecondSpin – This is another site that looks very similar to Second Spin. They will also buy your used CD's, DVD's, Blu-Ray's, and games. SellDVDsOnline – As the name suggests, this company will buy your DVDs, and they'll also happily pay good money for used video games or CDs. Their front page touts fast payments, and free shipping. Ziffit.com – This company specializes in buying CDs. They make the transaction process easy and fast. Payments are delivered through a variety of methods, including Paypal, bank deposit, or a check in the mail. Blue Rocket Books – They have a textbook buyback program. If they buy one of your used textbooks, they will pay you cash and shipping to them is free. Bookbyte – Bookbyte will buy used textbooks that are in good or acceptable condition. They pay via check, cash or Paypal. Cash 4 Books – Read Review – Sell your books and textbooks through Cash4Books. Simply enter in the ISBN numbers and get a quick price quote. They provide a pre-paid shipping label. CKY Books – This company will buy new and used books from you. You can ship to them for free and they will issue Paypal payment within 48 hours of receiving your items if they meet their specifications. eCampus – Read Review – Sell your old textbooks through eCampus. Free shipping labels provided. Choose how you want to be paid — check, direct deposit, or store credit. Powell's – Powell's will give you an offer for any of your used books. You can ship them for free to Powell's after you receive your offer. They will give you Powell's store credit or Paypal cash for the books you send them. Sell Back Your Book – This website will give you instant price quotes for the books you want to sell. Get a free shipping label to ship your books to them for free and then receive payment within three business days after they receive your books. Textbooks – This site offers cash or Paypal payments, fast pre-paid shipping, and you can get a quote to know what they may give you for your used textbooks very quickly. BookMonster – This site specializes in buying and selling used paperbacks. They're only interested in buying books with a sizable customer demand. There's a searchable list on the site nearly 60 pages long that shows what books they're buying right now. If your books is on the list you can get 40% of the list price. Textbook Rush – This site is primarily aimed at selling textbooks. They offer payments via paypal, cash, or store credit. Amazon Electronics Trade-In – Amazon will take your old electronics. However, all they offer as far as payment are Amazon gift cards. BuyBackWorld – They take all kinds of used electronics including cell phones, tablets, laptops, gaming consoles, and other things. Gazelle – Through Gazelle, you can sell your old, used or non-working cell phones, iPads, tablets, Apple computers, and iPods. Shipping to Gazelle is free. Swappa – This is a marketplace for selling (and buying) used smartphone and tablets. No seller fees, it is free to list your devices. Best Buy Trade-in – They'll buy back all sorts of electronics. You use an online tool to get a quick price quote, then you can either ship the item or bring it to a store near you. Apparently it can take 10 days to get paid, and payment is in the form of a Best Buy gift card. Nextworth – This company is associated with Target stores, and they operate very similarly to Best Buy. You can get paid either via check, Paypal, or a Target Card, and there's a 10 day turnover time if you decide to send your items in via mail Showing up in person at a Target store will let you get your credit on the same day. Gadget Salvation – This company is primarily geared towards buying and selling old computers, especially laptops. But they'll also buy smart phones and other types of hardware. Usell – They focus on smart phones almost exclusively. Payment arrives about 5 days after they receive shipment. You get your money via Paypal or a check. SellShark – [https://sellshark.com/sell]- They buy back used cell phones and computers, but they're only interested in products from Apple, Sony, and Samsung. Glambot – They will accept high-end makeup (not drugstore) to sell in their marketplace. It can be new or gently used. MUABS – Another online marketplace for makeup and skincare items that will accept new, or gently used, items you no longer want or need. You can set your own prices. Also, MUABS is open to either high-end or drugstore items. See more ways to sell makeup from home. The Real Real – This is luxury consignment. You can ship your items to them free or schedule a pick-up. They pay up to 70 percent of the sale price and claim that most listed items sell within 72 hours of being posted. Recycle Your Fashions – This is an online consignment shop. You can send them a list of items you'd like to consign and they'll let you know what they can accept. They pay shipping for the things they take, then they send you 50 percent of the final selling price for the items you sent when they sell. ThredUp – Sell your kid's clothes to ThredUp. You have to pay $4.95 to get a big bag to put the clothes in (which covers the shipping costs for the bag) and then fill it up. ThredUp will then send you a Paypal payment for the items you sent. Swap.com – This is one of the top-rated online consignment stores. The company claims that average sellers earn $150 per box they send in. Material World – Here you request a trade-in kit, and they'll send you a special shipping bag. You fill it with the clothes you want to trade in and send it back. They'll look everything over to see if it fits their standards and make you an offer. If they decide they don't want certain items, you have the option of having them sent back or donating them. Poshmark – This site functions more like an Ebay for used clothes, only with more of a social slant. Users can follow their favorite sellers, and you can build an audience over time by catering to specific niches. Tradesy – This company lets you post pictures of your items and set a price. If you have no idea what price makes sense, they'll make a suggestion for you. When you get a sale, they'll send you a prepaid shipping kit. Teachers Pay Teachers – Read Review – Upload your lesson plans, worksheets, tests, and activities for other educators to buy. Receive 60 percent royalties on the items you sell with a free membership. Lesson Plan Shop – This is a large marketplace with lesson plans for sale. You can use it to list your own lesson plans. Teacher Lingo – Another large lesson plan and educational resources marketplace. You can sell your educational resources here. They pay monthly via Paypal. Artfire – Read Review – No cost to sell individual crafts, just one monthly fee for your shop. Etsy – Read Review – Sell your handmade or vintage items on Etsy with your own Etsy store. Costs .20 cents to list each item for four months. Amazon Handmade – Read Review – This is Amazon's newest venture — a handmade marketplace. Supposed to be a big Etsy competitor once it is up and running. Hyena Cart – This site lets you sell handmade crafts and family-friendly items provided that they are also “green.” You can set up your own storefront on the site, but you must pay a $5 stocking fee when you stock your store. Big Cartel – This is a popular site that allows artists and crafters to set up storefronts. Big Cartel does not take a commission from your sales, but you are limited to just 300 items per store. Plans range from free to $30 per month for your storefront. You Can Make This – Selling patterns. Join their designer-author program and earn 50 percent commission off the patterns you sell. Craftsy – Read Review – Selling patterns. This is a great option if you have your own patterns to sell because Craftsy charges no listing fees nor do they take a commission from your sales. Aftcra – This company is focused on products handcrafted in the United States. They don't charge a listing fee, but they do deduct a small percentage from each sale. Bonanza – This is a big marketplace with a well designed website. They tout themselves as a company with seller-friendly policies, including cheaper fees than most of their competitors. Craft is Art – This company has a premium membership option where you pay a monthly fee ($7.99 as of this writing) and get unlimited listings with no additional fees. They also offer a free option, but you can only list 100 items, and you have to pay a 5% commission. DaWanda – This company gives you your own storefront that you can customize to your liking. They're only interested in handmade, rare, or one of a kind items, which means they're interested in vintage products and collectibles as well as crafted products. StoreEnvy – This company focuses on creativity and uniqueness in their marketing. They're looking for sellers with unique products and stories to tell. They have a very open marketplace where you can set up your own store within minutes and start selling. There is no charge for opening a store, but they keep a 10% commission on all sales. Zibbet – This site sets itself apart from other craft selling portals by offering an online web builder and web hosting for businesses that is automatically integrated with their broader online marketplace. They offer four levels of membership, from $4.00 to $16.00 a month, with the higher priced versions offering more advanced features. Zazzle – Read Review – Set up a store on Zazzle and market your unique artwork and designs.You can sell your designs on T-shirts, mugs, calendars, and more. Set the sale price and receive ten percent commission after Zazzle takes their cut. CafePress – Read Review – Design and sell your creativity on actual merchandise with your own CafePress shop. CafePress has a base price for every product, and you can keep the markup amount. TeeSpring – Read Review – Create your own T-shirts and then sell them. No upfront costs to you, and very easy to do. Society6 – This site works a lot like Cafepress, but they seem to offer a slightly wider range of products for your designs to be printed on. Once you've become a verified seller, listing one of your designs is as simple as making a post. Threadless – Read Review – To get your items listed for sale on Threadless, you have to win a contest. They post themed challenges periodically and any designer can submit their ideas, which are scored by users. The winning products are added to the store. Card Cash – Let CardCash know what gift cards you'd like to sell, and they will make you an offer. You can choose to receive either cash or an Amazon gift code for your sold cards. CardPool – This site will give you up to 92 percent cash back on the gift cards you sell them plus they offer free shipping on mailed in gift cards. Gift Card Rescue – This company will only accept plastic, physical gift cards. They must be worth at least $20. Gift Card Bin – To sell your old cards to Gift Card Bin, use their online tool to get a price quote, then ship your card. You'll get paid, via Paypal, after your shipment arrives. Amazon – Read Review – It goes without saying you can use Amazon to sell just about anything. Amazon FBA – Read Review – This is selling on Amazon where instead of YOU shipping the item to the customer, Amazon does. You source the items and send them to Amazon. They take care of the rest. Storenvy – Create your own online store to sell anything in. Facebook Marketplace – Sell your stuff on Facebook and share your listings with your friends and people in your area. Bonavendi – This site doesn't actually buy items themselves, but they offer a great online interface for doing price comparisons between different buyback sites. Eaglesaver – This company buys back all sorts of items, from electronics, to music and books. To get a quote just pick the the type of item you want to sell and type in either a UPC number or ISBN code to get an instant price quote. They are known for fast payment. Ebay – Read Review – Sell anything. You can set up auctions or you can give your items the “Buy It Now” option so your buyers don't have to bother with bidding. Listia – This site works fairly similar to Ebay. The big difference is that your sales give you store credits that you can use to bid on other items. You can also have the credits converted to cash if you prefer. Using the above list, you should be able to begin clearing out all the old stuff you're no longer interested in owning, and make a decent profit in the process. If you have any personal experience with the sites listed above, or if you know of any other sites that should've been included, please let us know in the comments below. Looking to Learn Skills to Help You Have Online Selling Success? Amazon FBA (Fulfillment by Amazon) is something many people are doing now to earn a living selling stuff online. The great thing about Amazon FBA is that THEY ship to your customers — not you! You just source the items, ship them in bulk to Amazon, and they do the rest! If this is intriguing to you, you can sign up for this FREE 7-day email course from Jessica and Jeff Larrew (6-figure Amazon sellers) to learn more about how it all works. Post originally published June 11, 2012. Updated and re-pubilshed February 3, 2018.